Jaypee Kingswood Oriental, a part of Wishtown, Noida, is set on 5 basic pillars of life- Long Life, Harmony, Beautiful, and Happiness, Blessed. It is an exclusive community that offers unparallel ambience and lifestyle. Spread over acres of landscaped area and adjacent to 18hole Golf course, the homes get the expansive views of the Golf greens on one side & chip & putt golf course on the other. The architecture for these Kingswood Oriental homes is inspired by the oriental standards using wood, bamboo and colourful stones. The various elements incorporated in Jaypee Kingswood Oriental Resale creates a personal haven for the residents providing perfect living for the select few who have the taste of finer things and wants to explore the rare luxury lifestyle. One of the key attractions of Kingswood Oriental is its clubhouse, which has rich and elegant ambience creates an ideal place to relax and rejuvenate. An ornamental and South East style designs form the basis of the architecture of the clubhouse. 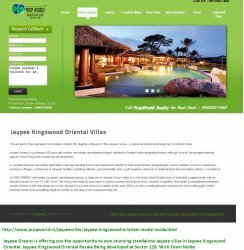 The Kingswood Oriental homes are offered in areas of 3850 sq ft., 4550 sq ft., and 4700 sq ft.
We are part of the Jaiprakash Associates Limited, the flagship company of the Jaypee Group - a well-diversified industrial group of northern India. Jaypee Greens is a premium 450-acre golf-centric real estate development project situated in Greater Noida integrating homes with golf course, landscaped emerald spaces, resort living and commercial developments. A complete lifestyle real-estate destination offering individual homes and apartments amidst 18-hole Greg Norman designed golf course, member exclusive clubhouse, luxurious cottages, conference & banquet facilities, tempting eateries, spa and health club, a golf academy and host of entertainment and recreation options, in existence. JAYPEE GREENS real estate & property development group, a segm ent of Jaypee Group which is a well divers ified infrastructure & industrial conglom erate with an annual turnover of over 15 ,000 Crore. The Group has made its pres ence in various sectors like hydro p ower, cement, hospitality, real estate & educational institutions. Jaypee Greens is the real estate arm of the Jaypee Grou p and since its inception in the year 2000 h as been creating lifestyle experiences from building golf-centric premium reside nces to building mega townships to buil ding a self sustained mega city.